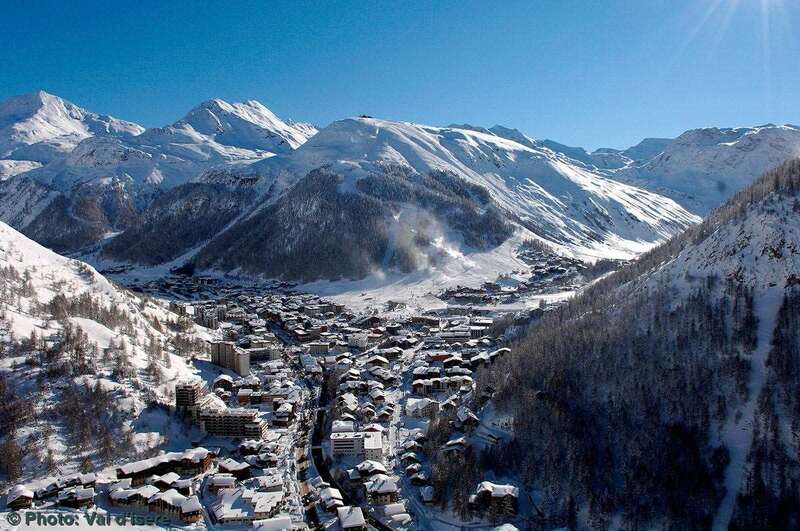 Chalet Hotel Le Val d’Isere has one of the best locations in Val d’Isere, its right next to the tourist office in the centre of town and just a few minutes to the pistes. To get to the slopes you just cross the road and take a short cut through a parade of shops to the Solaise beginner’s piste. There are multiple lifts here giving you access all across the resort and over to Tignes. The building is a tad dated and layout inside is a bit unusual but when you get used to navigating your way around inside you’ll get used to the quirkiness and how to get from A to B. The food is fantastic and the bonus of a swimming pool in such a central location is great. The rooms are clean and comfortable but this place is all about location, location, location. There are fantastic views from the balconies and the higher your room, the better the view! You can be reading a book in your room or having a shower and be in a bar or restaurant within 10 minutes. Same on the return, you can be in a bar at 01:00 and then be in bed, asleep by 01:10! Inside, you’ll find a cosy bar and lounge, with comfy leather sofas and armchairs, perfect for unwinding in the evening or in the afternoon with a book if you fancy a break from skiing or boarding. You’ll love the spectacular views of the mountains and tree-lined slopes from the dining room’s floor to ceiling windows. Located high up on the fourth floor of the hotel, the dining room looks out onto the Olympic downhill course, which is illuminated in the evenings, providing sparkling scenes of snow clad trees. The Chalet Hotel Le Val d'Isère is the perfect for those who want to relax after a hard day on the slopes. Not only are the bedrooms comfy, but guests can also relax in the hotel's lounge and bar area and take advantage of the free Wi-Fi. To top it all off, guests are free to use the heated outdoor pool just alongside the hotel. At Chalet hotel Val d'Isère, you’ll love the spectacular views of the mountains and tree-lined slopes from the dining room’s floor to ceiling windows. Located high up on the fourth floor of the hotel, the dining room looks out onto the Olympic downhill course, which is illuminated in the evenings, providing sparkling scenes of snow clad trees. Breakfast, afternoon tea and dinner with wine are all served here. Evening dinner will be 3 courses with wine, the perfect time to reflect on your day on the slopes and unwind. A children's high tea is available 7 days a week for children 12 years and under. One evening a week dinner is not served in the Chalet hotel allowing you the opportunity to dine out at one of the excellent local restaurants. I stayed at the Chalet Hotel Le Val D&#39;Isere for 1 week towards the end of the 2017/2018 season. The location is fantastic right across from the main square near the tourist office therefore, access to the slopes is extremely easy and if you are wanting to go shopping, out for dinner or to a bar for a few drinks it takes no hassle at all. The Chalet Hotel itself is run by friendly and helpful staff and nothing is too much effort, all the meals are delicious with plenty of wine of your choice (red, white or rose). Awesome location, so central to all the important places - such as Pacific Bar. Rooms basic and on point, and the catering is superb - 3-4 menu choices each night, and all delicious (including the veggie meals - no corners cut there). The swimming pool though is sublime - temparature closer to a hot tub, makes for a lot of fun when it&#39;s tipping it down with snow. Best points; location & facilities.